How our mozzarella is made? Our production methods have origins and keep close links to the ancient cheese makers' way of production. We try to keep as close to traditional methods as possible, whilst still maintaining very strict health and hygiene rules. Two thirds of our creations are still worked by hand, only one third is made using new technology. 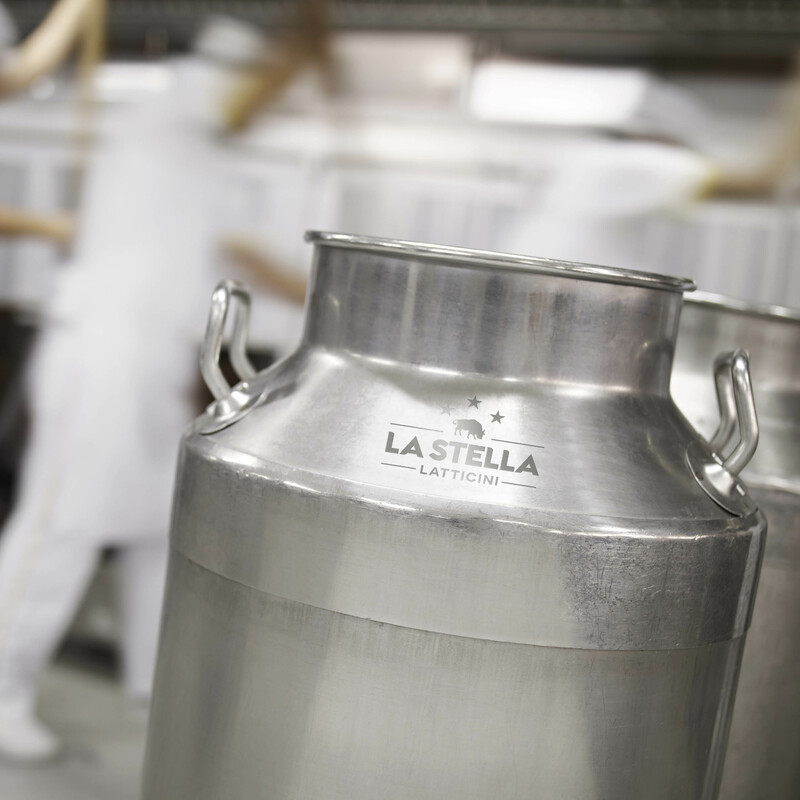 The La Stella factory started its path with only buffalo milk production, today we use Buffalo, Cow and a combination of both milks. Buffalo milk products are our pride and joy and they are a handcrafted art; cow's milk is used for our Santa Lucia and Fior di latte products, using different, more modern techniques and finally the precious La Perla that is a perfect combination between cow's milk and buffalo milk. All our production starts with quality control of filtered milk and the subsequent addition of non-animal rennet. Left at room temperature, milk returns to its normal level of acidity thanks to the generation of thermophilic bacteria. The process stops when the curds are cut in small pieces. At this point, the whey is separated and the curd is put to rest for a maturation period that can be from three to eight hours dependant on the desired final product. The acidity level is checked during the resting period, when the PH is around 5.4-5.5; the whey is drained and curd mass, which is similar to bread dough. It is then cut into small little pieces ready for kneading and melting. Traditionally, the dough is melted in a barrel of boiling water, then the curd is stretched until it is ready to be formed into various forms of mozzarella. 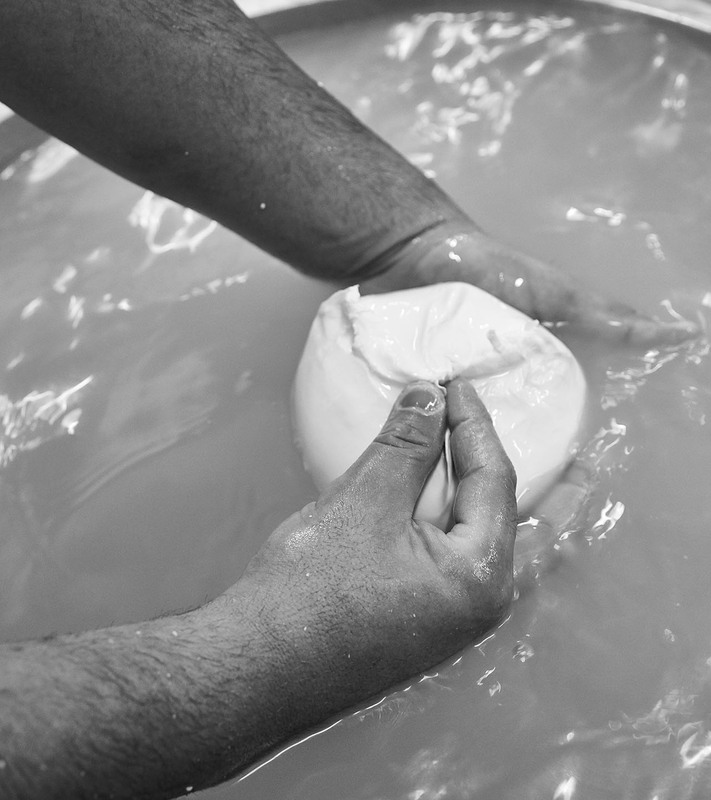 Once formed, the mozzarella is soaked in a salt water brine. During this time, the salt is absorbed by the mozzarella giving its characteristic flavour. 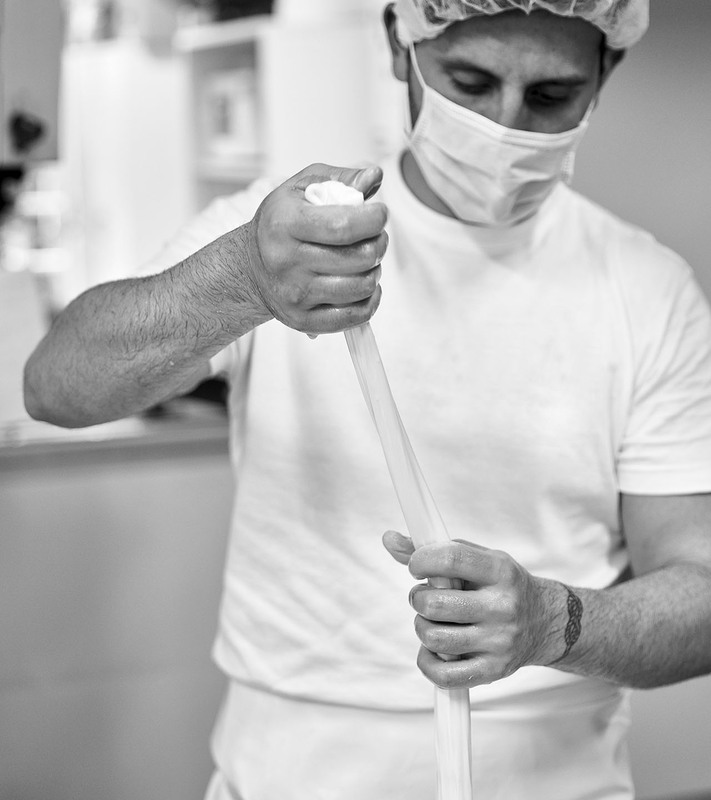 The duration of salting process is a very delicate stage that cleverly dosed, makes our mozzarella very unique.